Oh, the tall tales fisherfolk tell. As a matter of fact, they say that if you weren’t born with the ability to stretch the truth just a wee bit, spending time on the water will surely school you in that all-too-human trait. 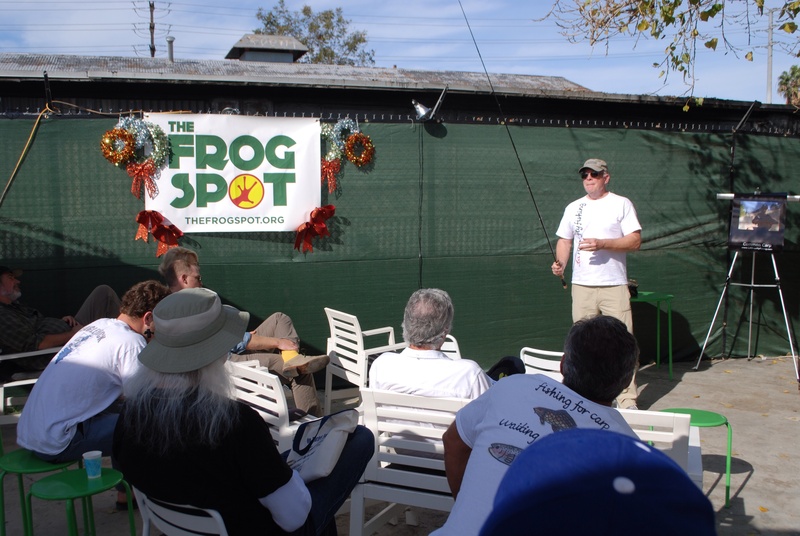 But, at the Frog Spot, sharing and learning more about fishing the L.A. River Sunday, not a tall tale emerged from the gathered fishing fanatics, just a bounty of hard-won knowledge about our river. The weather was perfect; the setting, urban-divine, as bicyclists zoomed along the bike lane, possibly fired up by CicLAvia, while AMTRAK whistled its station arrival not far away. — William Preston Bowling, who organized the first Off Tha’ Hook fishing derby in September, served as MC, but he also filled in the crowd of a dozen or so participants on Friends of the Los Angeles River (FoLAR) line recovery efforts. Your line has a life of around 5,000 years, so please think twice before tossing that next bird’s nest into the water. Grove Pashley, of LA River Kayak Safari, reminded us of two blue herons separately caught up in bird’s nests of line in the last couple of years. I know one died, but I’m not sure of the other’s fate. Bowling said that soon there will be line disposal tubes at high-traffic areas along the river. FoLAR will recycle the line by sending it to Berkley, a company that actually re-purposes used line, turning it into new. — Robert Blankenship from Trout Unlimited turned his darkroom PowerPoint into a daytime handout, and regaled us with tales of Southern California Steelhead recovery efforts. His presentation was made all the more sweet by a guest appearance from Tom Tomlinson, who wrote “Against the Currents: The Unlikely Story of the Southern California Steelhead” this year, published by the Aquarium of the Pacific in Long Beach. If you haven’t read this important book yet, pick it up. Blankenship showed us how Santa Barbara has re-designed its flood control channels to include holding water for steelhead returning from the ocean. The story of the steelhead here in our truly unwelcoming climes is one of courage, fortitude and grit. There’s actually a self-guided tour that links steelhead art and brew pubs, which sounded like the best of both worlds to many of us. Look for more from TU under the local leadership of Blankenship, a strong advocate for our river. — Next, Lizzy Montgomery from the Resource Conservation District of the Santa Monica Mountains told us about the INaturalist app, and how to use it. Take a look here for more info. I’m not sure that as a fishing community we’re using this as much as we could/should. The research that comes from fishers out there on the water can greatly aid biologists who can’t use their standard procedures for species and fish counts. As she said, ” I can’t imagine we would use SCUBA gear on this river.” Agreed. — Ban Luu, who has plied the river since 2007 using traditional tackle, told us he had no idea there were fish in it when he first cast out: He was testing a new rod and reel to get ready for an ocean trip! With each cast, he heard splashing, thudding, all the auditory telltale signs of big fish. “I was hooked,” he said, no pun intended. And Luu is the right guy to get hooked, taking time to keep a detailed fishing journal, perfecting his light tackle gear after much research and trial and error. Also, he has perfected his own masa blend with garlic, after rejecting both bread and tortilla baits, both well regarded by locals. And … ready for this, Luu said he’s caught over 2,000 fish since 2007! After listening to his presentation, I am sure this isn’t a fish tale. As for yours truly, I discussed the usual suspects we catch on our river, as well as fly rods and flies that give you the best chance of hooking up. I, too, used old-school photographs from this blog that included fish and the commentators who sent them in to illustrate my talk.Simply put, without the LARFF community, I would have had much less to discuss. Thank you for your support and friendship over the last four years! Finally, Bowling reminded us that we are all invited to participate in the return to the lower section of the river, Saturday, Jan. 3, from 2 p.m. until dusk. Get in touch with him (wpb@folar.org) to reserve your spot (free), and help to document what fish are in that lower section on WIllow Street. Who knows, steelhead may yet be waiting for discovery, akin to those spotted on the San Gabriel River. Blankenship shared a wonderful picture from a few years back of a large steelhead hanging out by a discarded TV in a West L.A. flood control channel. It was a renewed call to “bring ’em home,” as FoLAR co-founder Lewis MacAdams would say.